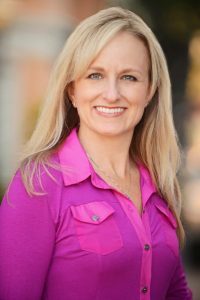 Today on the Doc On The Run podcast we have Tina Dean who is the owner of a Massage Works in Los Gatos. Tina and I recently met and we started talking about massage and the value of massage with runners and triathletes and those who really train a lot. We were talking a lot about the many different benefits that massage can bring to runners. And so I thought it would be great to have her on the podcast today just to talk about massage and how runners and triathletes can really use massage as another one of the tools to simply run more, train more, train harder, workout more, build their fitness more with a lower risk of injury. Dr. Segler: So Tina welcome to the show! Tina Deane: Hey Chris thank you so much for having me. Dr. Segler: It’s really great to have you here. I appreciate you coming on the show and taking time out of your schedule. I know you had a really busy day today. And even though you had a really busy day you still come on and talked about massage and how runners and athletes can use massage to train more and avoid risks of injuries. There’s lot of stuff about massage I think people don’t understand. But before we get all the specifics about it maybe you could just give us a little bit about your background, education, training and what it is about working with athletes and massage that really interested you. Tina Deane: I’ve been doing massage therapy for sixteen years and I was kind of at a juncture in my life when I was looking for something really good to do to help more people and to help people and really do something good and so massage just kept coming up. It was something I always liked and was good at. I was the person that people would be like could you just rub my shoulder like never having known anything about massage back then. I started going to this massage school that was local and it was basically a mentorship under this guy name Royal Jacobs who is a massage genius. I feel really really blessed for the type of education I got because the entire training was in depth in anatomy and how you find problems, fix problems and make pain go away. So I’ve found that the reason I like working on athletes and people who train really hard is because I like to fix problems, when people train really hard they get really good, because they’re really pushing their body to a high extrem. So when you tweak something just a little bit to improve it, they really notice so that really makes it fun. Plus often they have new and exciting problems on a regular basis which is never boring! As I’m a bit stubborn, I’ll keep going after something until we figure it out and find the root of the problem. Dr. Segler: Well that’s a big part of it because a lot of athletes will develop issues and they do take some exploration to figure out. When I was heavy into my Ironman training, there was one year, I was doing a couple of Ironman races a year and then there’s one year I even did four of them in one year and I got this crazy thing with my gluteus medius on one side. It would just completely lock up and it took a lot of massage work to get that thing to finally release. Part of it was I was always training all the time. But it was an odd thing and it’s not a normal thing to have that happen but that’s the thing with athletes, you can get one problem that kind of get set off and gets really locked up. It’s true, we all can develop those issues. A lot of people will say that massage is a tool that athletes should use regularly, you should just have it schedule and a lot of as frankly think “Well okay. Well that’s just something that professional athletes do” But massage can benefit everyone because these odd muscle tweaks, as you say that “crop up” for athletes and massages really help. But even if you don’t have some weird gluteus medius thing like I had, there is a real benefit in massage in terms of speeding recovery. In the simplest sense, there’s so much talk now about inflammation reduction, about really maintaining a really healthy diet maybe even being gluten-free to reduce digestive inflammatory processes and doing stuff after your workouts to reduce musculoskeletal inflammation. So maybe you could just speak to that a little bit and tell us a little bit about how massage can actually speed the drainage of inflammatory fluid that can impede your recovery. Tina Deane: Massage in that case works mostly through circulation. Massage improves circulation. After you’ve worked out, you’ve sent lots of blood to the tissues, often there’s also some sort of adhesion and tightness that is there afterwards especially for doing super strenuous workouts or long workouts, those muscles are just tense and tight and by getting those to soften up a little bit and flushing the fluids, you’re improving a turnover in those muscles and how they recover and how you feel. A lot of the pain reduction occurs with that, too. You have to get that turnover and kind of turn down the nervous system a little bit to improve the pain level. But it’s one of the interesting things you say about massage being done on a regular basis. I think one of the benefits is the awareness of what’s going on in your body. Athletes are usually tuned into anyways but they could be hyper focused on certain areas. Having that connection with a massage therapist actually working throughout your body and noticing “Oh this is out of balance here, this muscle is tighter than it was two weeks ago” is an important aspect as well. Dr. Segler: Right and that only happens if you have a therapist who you work with consistently right? Tina Deane: Pretty much, I mean if you were really paying attention the whole time you might be able to notice yourself, but probably not. Dr. Segler: As an example, I’m a physician. I think I know a lot about anatomy. I think I know a lot about biomechanics. I think I know a lot about running and everything involved in terms of the physiology of running. However there’s no question that any massage therapist who was working on my back more than a couple of weeks a row will easily identify all these problem areas that I get in my back as a result of the motorcycle accident from many, many years ago and they’ll notice the changes in a way that I never could because I can’t touch it, it’s on my back. Tina Deane: That’s a good question because it’s definitely an issue. Because there’s so many large massage schools just kind of turning out very standard massage people. The best way, I think always is ask around. Ask other runners, ask chiropractors. Ask whoever you might be seeing that’s in that world who they see. And of course if you really look around on Google and websites you can tell who is really into either one working with athletes because they’ll talk about athletes on their website or they seem to be really into fixing pain and fixing problems. Every once in a while I get someone who comes in to see me and they won’t want specific work on issues. In those cases I wonder to myself, “Did you read my website?” Because my website is all about pain and getting to the root of the problems and getting muscles to release. So those are the things to look for when searching for the best massage therapist for runners. There’s also specific styles of massage people can learn like myofascial release and trigger point and deep tissue and sports massage. Those are all things to look for a because It means that people have training above and beyond kind of a standard massage program. Dr. Segler: There’s a huge range of skill and experience among massage therapists. There was a patient that I did a remote consultation for who was in Thailand. We were talking about physical therapy and there were no physical therapists where he was in Thailand. He was in Thailand six months a year and I asked, “so what about massage?” And he answered, “Oh I get a massage for four dollars over here.” But it is different than what you do. There’s a wide range of training and experience, right? Dr. Segler: But again that just speaks to the whole range of training. I’ll share one story very briefly which is sort of like my massage horror story. I’ve had lots of massages in lots of places. I’ve gotten them at Ironman races with varied success. There was one guy who helped me after Ironman Florida and he was fantastic! He was in Panama City Beach and I would recommend him to anyone. Many years ago, I had a motorcycle wreck. My back is really messed up in the mid-thoracic region and I went in for a massage because it was so locked out that it was actually painful. It was causing lots of pain. It used to get so painful that I would actually stand in the doorway and grind into the door jam to try to work that loose. I would get bruises on my back and I was in one of those phases where it’s killing me. So I went to one of the massage factories, a massage chain or something. I won’t name them. I did not write a review on Yelp. Although wish I had in retrospect. The massage therapist who was treating me was very young. I think literally she got out the day before something, yet she pretended to be like this evaluation expert. I went in, I was very clear with her. I explained, I separated both of my shoulders when I was racing motorcycles, I messed up my back, herniated disc, this is where the problem is and I need you to work on this area. I had a one hour massage. So she laid on my back, which also is uncomfortable because I separated both of my shoulders. She starts working away. She worked for over an hour on my pecs. When the hour was up, I was still on my back. She worked on my pecs for an hour. My right arm was actually completely numb and tingling. She it made a significantly worse, not better. When I got up I just said, “you know really I’m not happy with this. I mean truthfully it’s like I am significantly worse when I came in here.” I actually left there and went to a different massage place and got a ninety minute massage to fix it. I wasted a hundred dollars and an hour and then it worse because I had to get a longer massage in another place. Tina Deane: That is a horrific story! Dr. Segler: The moral of the story is that out of hundreds of massages and that’s only happened one time. But it did happen at one of these massage chains where people did not have the highest level of training. And this therapist seems to not be really adept at working with the subtleties in athletes. I don’t think what I had going on that day was subtle, but that is not something that would happen with somebody who has not only the level of training but also the level of experience that you have. I think that experience does matter and training does matter. Tina Deane: I’ll share story as well. We have this client who told me a story years after I first started working on her and she was coming to see me for knee pain from running. She wasn’t a long-distance runner but she was running regularly enough that she was having pain in her knee. She came in to see me and I immediately worked on her, quite a lot her lateral quads and IT bands was killing her because it was super tight. It was killing her. But apparently she laid there the entire time and like this girl doesn’t know what doing. Why is she working on the outside of my leg? The pain is on the inside of my knee. What is she doing, it’s a waste of my time? Until she got up and the pain was gone. Tina Deane: Although I do find that athletes are a little bit more tuned into what’s going on and at least that something might actually be your pecs too. But if what’s bothering you is your back right away you’ve got to address that, too. My pet peeve with going to massages if you tell somebody something hurts and they just barely go over it and then just like finish your full body massage and don’t focus on the thing you told them hurts. That makes me bananas. Dr. Segler: It is a two-person interaction. It’s not like you can just lay on the table. It’s not like somebody polishing the tin woodsman in the Wizard of Oz. It’s a different thing. Obviously it’s your job to fix it. It’s your job to take the information you have from us, figure out what’s going on with the athlete and figure out a way to make it better. But it’s the runner’s job, it’s the athlete’s job, who has the issue to clearly communicate to you what it is that seems to be the most bothersome. If you don’t really know what the problem is, how can you address what seems to be the biggest issue? Tina Deane: It is sometimes a priority thing. If you have a race coming up and your Achilles is hurting but you also have shoulder issues, you start with the priority first. Dr. Segler: That’s a good point. So it does change somewhat in terms of the character massage or type of massage you get. If I were traveling to an Ironman race, I get uncomfortable on planes and I usually feel worse when I get off the plane. Normally when I fly somewhere if I just go run five or six miles, I feel way better. But I don’t really want to go run five or six miles right before a race. So if I go to the event and get a massage, if they do a super aggressive ,hard massage to try to work out these adhesions and all that stuff, that’s not great for you for racing. So why don’t you explain why it is that athletes shouldn’t get a super aggressive, really intense deep tissue massage right before an event? Tina Deane: Right before a race you don’t want get a really deep massage that will make you sore. Everyone who’s ever had a real deep tissue massage now that can it can hurt and you can get sore afterwards. It’s kind of like a workout. But what you can get is more of a circulation and friction and things to warm up the body and increase the circulation. The other thing is if you get too much deep work you can actually lose some of the glycogen in the muscle which of course, anyone doing a long race has really worked to make sure it’s there. You don’t want that happen either. So it’s best if you have things that need to be worked out to do it a couple days before. But like you just said if you were doing an Ironman, that wouldn’t be the case so you could probably get some serious work on your shoulders done like your traps and neck and that kind of stuff and it wouldn’t affect you in a marathon at least. Perhaps Ironman might be an issue and where getting lots of circulation and like friction and things to warm up the muscles to just loosen them up beforehand on the legs and the back and all that kind of stuff. Dr. Segler: What about after the race? It definitely makes you feel better and I believe it really speeds my recovery if I go the day after race. They usually have these massage table where you can have a very brief massage right after the event. I truthfully like I don’t know like getting massage right after finishing an Ironman. It never feels good for me to have a massage immediately like literally ten minutes after the race. But the next day I think it’s really valuable. What’s the best time after a marathon or triathlon ? What’s the best timing for a massage post event to speed your recovery? Tina Deane: It probably depends on each person, how quickly you recover. It kind of depends on your fitness level. If you are at the point where the next day you’re feeling pretty good and go ahead get worked on. If you’re still super tender and sore the next day, you’re probably better off in an ice bath than you are getting the massage. Then maybe you could get a massage one or two days later. It all depends upon your pain threshold. If it’s going to kill you to get worked on, then you probably want to skip it and wait until it’s a little bit easier. I have worked on people right after races, like actually the same day as marathons. It works for them partly because they’re used to it and for those people in particular the massage was part of the training. So I worked through them the whole training. I’ve gotten them through all the bumps and sore spots and hang ups and all that kind of stuff that came up. Got them ready before it. We did one of the warm-up massages and then right afterwards. For them it was a part of the whole process anyways so you could do it at any time. Dr. Segler: Okay but would you do something different after a race? I mean you’re not going to be super aggressive? Tina Deane: No, again it will be lighter because the muscles just feel full of fluid. If you could just try to just get that inflammatory fluid to move that will help. It almost feels inflamed and swollen and you want to get that to not feel that way anymore. Dr. Segler: So it’s more like draining lymphatic. You’re just kind of pushing all that fluid out right? Tina Deane: Yeah and if you get some of that fluid to go, and then you canget into the muscles and get that the to move out too then you’re getting into a good place and then the muscles start to soften the pain start to ease up. Then you’re on a good spot. Dr. Segler: I have a question for you. I’m definitely guilty of this. I must say I know that I should know better. But whenever I go get a massage, every time I get a massage, the massage therapist says, this been virtually all of them, at a race, not in a race, anything. They’ll say, “You need to drink lots of water now because you just had your aggressive massage.” And I always think “yeah I know that.” And then I go to bed. 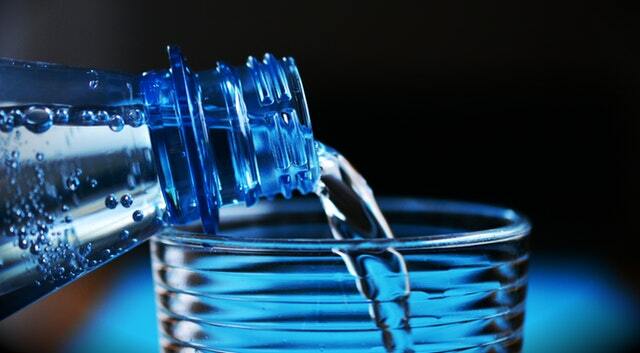 Why it’s so important to drink water after a massage and how much it will help you if we actually follow that advice? Tina Deane: Well I think I’m going to totally blow this because actually the research shows it actually does not matter that much. It’s important to be hydrated but you are not going to increase any amount of flushing of anything out by drinking a ton of water afterwards. Now that being said, if you were dehydrated to start with you’re going to be in trouble after a massage particularly if it’s kind of a deep tissue massage, you’re going to feel crummy. You do want to be normally hydrated. I think we say that because most people are dehydrated. Dr. Segler: It sounds like the advice is not necessarily get up from your massage and drink a gallon of water. But if you know that you’re going to have a massage that day, it’s probably actually more helpful for you to hydrate thoroughly throughout the day leading up to the massage. Is that right? Tina Deane: Yes. Then everything in your body is really fluid and everything will really moving and you’ll get the flushing you want. You’ll get the toxins out and you put blood in and your blood will move easier and all will move better. Dr. Segler: What other advice do you have for runners? What are the other key points that they need to consider when they’re trying to find a massage therapist. Tina Deane: Well so the other thing is I mean getting massage is wonderful for all athletes. Professional athletes get a massage every day. It’s sounds super crazy. But massage is super good for you. But I don’t want to discount the fact that you can do a lot of self-massage. I think that is easily important. There’s so many tools now actually it speaks in the pain we’re all in. If you go to sporting goods store or drug store, there’s all kinds of self-massage tools. Just get some and try them. We’ve all done foam rollers and we’ve all done different kinds Lacrosse balls or whatever. You can get into some stuff like that. I think having someone with skilled hands working on you is still the best way to go. But definitely you need to be doing some sort of muscle manipulation to really work out some of those muscles because stretching just doesn’t do it all. Dr. Segler: Along those lines, and actually, really in retrospect I wish I had taken a photo of it. Doc On The Run’s 3 favorite self-massage tools. But I was one year was leaving the hotel room checking out from Ironman Louisville and they had the housekeeping cart on the floor and I was walking past it with my bike leaving the hotel. In the garbage can on the side of the cleaning car, there were four of those stick roller massage tools. Four of them. They had all clearly been accidentally left behind by Ironman triathletes checking out of the hotel rooms. I’m sure that by the end of the day the housekeeping staff was like “What in the world were these things?” and why there’s so many of them in this hotel? But I think self massage is really useful as well. I know that there’s no substitute for getting a real massage from somebody that knows what they’re doing. But basically my three favorite tools are the Stick, I do have one of those. I certainly take it with me to races. The second one I actually like is this plastic thing called a Knobble. It’s basically like a handle with a point on it and it you can really grind into stuff to work at loose. 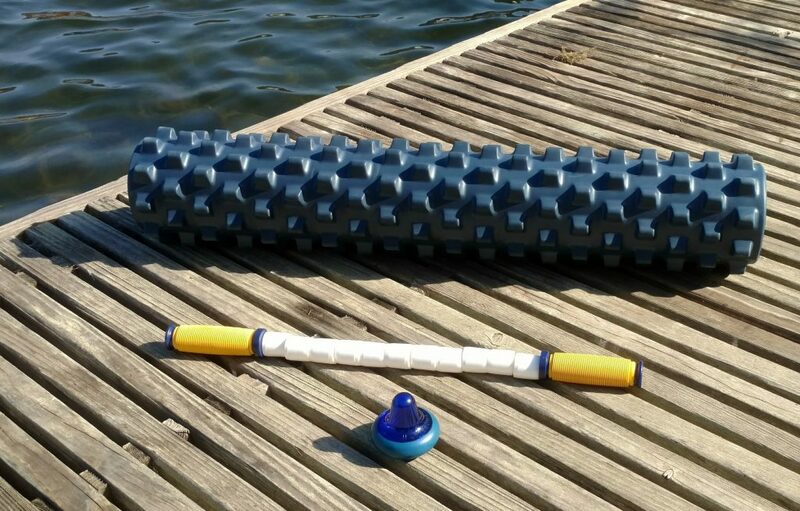 So I actually use that for my gluteus medius and then my third favorite tool is actually the Rumble Roller which some people just cannot tolerate it, I actually like the black one. But it has its kind of the same stiffness as a four wheel drive a car tire. But man it really works like to grind out the stuff my back. I have never found anything that works as well as that, it does take some getting used to I will say that. But what are your favorite tools for self-massage? Tina Deane: I also have a rumble roller, I really like that. I like balls because you can do more trigger point works. I have a massage ball. I just went on vacation and I was on an eight-hour plane ride and I brought one with me because I get sciatic on one side. I could sit on the ball for a little while and it would just release things and get rid of the twitchiness. Dr. Segler: I do house call and so I get some issues just because I’m driving all day all over the Bay Area because I see athletes at home. I actually keep a lacrosse ball in my car which I use for that purpose. In terms of massage balls, what do you like? A lacrosse ball good, is it too hard? Do you like the trigger point balls? What do you think is the best kind of ball for most people to use? Tina Deane: It depends on your tolerance. Because like the rumble roller, some people can’t take the rigidity. I use one that’s called a massage ball. I bought it on some massage site. But it is almost the size of like a racket ball. But it’s solid black rubber. Dr. Segler: Lacrosse ball is a little bit softer than like a pool cue ball but I guess it’s pretty hard and it’s a little bit unforgiving if you have a really locked up spot. Tina Deane: I think it’s a little bigger too, isn’t it? Dr. Segler: It is pretty big yes. It’s about the size of a tennis ball. Tina Deane: So it is not good for all locations. You kind of need a variety because some areas, you want smaller things. Someone was recently introducing me how to do that. There’s a company called Yoga Tune Up that actually has tools and videos. I don’t know much about it but they have a cool ball called gorgeous ball and it’s actually squishy and she was teaching me how to do myofacial release using the ball on bare skin, it’s pretty cool. Dr. Segler: Okay great! All right well that’s useful. For athletes obviously to get regular massage I think is better but to add those in addition to just doing some self-massage to get you in between appointments before actual real massage work can be helpful. Right? Tina Deane: Oh yes. I have a great example of that. I have someone I have worked on about ten years. He’s a trainer. I work with him and work with his clients and have worked with him at least a decade but anyways he used to play football and do bodybuilding. The guy was huge. He was a huge project for me. It was always his legs were tight and then his low back and for years we just worked through his legs, worked through his legs. We had good work anyways and finally we got him in really good shape but not perfect. I mean he was coming in every week and there was always stuff to work on and every couple of months his low back would go out to the point where he would be in pretty bad pain. I got him using a roller. A foam roller all around his legs and his back is not going out like that again in like a year and then I bought him one of those rumble rollers, and he thinks I’m not very nice because of that. Dr. Segler: But it works right? Dr. Segler: But everything is not supposed to be comfortable. After a race I do an ice bath. So I’d normally on the way to the hotel or the way home from the race, wherever I’m going to wherever I’m staying. I buy ten pounds of ice and I put in a bath tub, fill it up with water and I sit in for like fifteen minutes. That is not comfortable. It is not fun. The truth is when somebody tells me that mile repeats are fun, they’re lying. Self massage isn’t always fun or relaxing. Tina Deane: I always say that doing an Ironman is not easy. There is a significant amount of pain in marathons and Ironmans. Dr. Segler: There is pain n all training. That’s the whole point. There is discomfort in all of this stuff. The truth is I would rather eat ice cream than kale. But if I want to train and I want to recover, ice cream is not the best thing to add to my smoothie. I put kale in instead not because of the taste of kale, it’s because it works for what I wanted to do and it helps me to recover and train more. It’s the same thing with massage. In terms of the rumble roller, I won’t say it feels good while I’m doing i. But it feels good after and it accomplishes a goal. Getting massages, such as deep tissue massages, you may have to hold your breath a couple of times when you’re getting worked on. But there’s a payoff for that just like there is with hard workouts. I know that you certainly have a great practice. I know that you and your company Massage Works has been voted best massage in Los Gatos multiple times as well as being voted best massage therapist. But you only see clients in Los Gatos, is that right? Tina Deane: That is right. Dr. Segler: How do people find you? If somebody is in the Bay Area or in Los Gatos or Silicon Valley or somewhere around the peninsula like how do they find you? What’s the best place to go to get a hold of you? Tina Deane: The best place to go is to my website http://massageworkslosgatos.com/. You can also Google my name Tina Deane and so you can find out more about me on the website. I also have an online scheduler on there. Anyone who just want to try to get in to see me, that’s best way to do that. But even if anyone asks questions, just to go on there and send me a question about how to find massage therapist, what to look for, I’m happy to help. Dr. Segler: Okay that’s great. You do have a lot of helpful information on the site. You even have a lot of information specifically about massage therapy for runners and about why that’s such a great addition your training schedule. I know you have a lot of information that is really helpful so we’ll put links to your site on the show notes page. So if you’re looking for somebody to do massage in Los Gatos, Silicon Valley, anywhere around the Bay Area and you’re down in that neck of the woods and Tina would be the person to see. We will make sure those links are available on the website so that they can reach you and get” straightened out” so to speak. Tina Deane: I appreciate that! Dr. Segler: All right Tina! Thanks for coming on to the show. Any words of advice for the runners out there? Tina Deane: Just listen to your body! Dr. Segler: And when it screams, it needs help, go get help right? Tina Deane: Yup, that’s the thing. Pain is a message! Dr. Segler: That’s right! All right Tina, thank you very much. I really do appreciate you taking time out of your busy day and out of your schedule just to share all of your knowledge about massage for runners with us today. Tina Deane: Thank you, it’s my pleasure.